The “Legendary Book of Sun-Moon Swordplay” is a story in-progress by Melanie, and posts may not be regular as the author is juggling 2 books – “Legendary Book of Sun-Moon Swordplay” and its Prequel – while juggling real-life responsibilities. If you rather receive a notification when a new chapter is posted, you may use the “Follow Blog via Email” feature available at the bottom right of this site. in spcnet.tv Sun-Moon Swordplay chapters are around 80’s but I can’t find the text. So I flied to here. but I only find up to chapter 9. where are the other chapters? As Melanie started writing the story a looong time ago, she wishes to take this chance to do some minor tweaks to the chapters as well as correct some grammer, which is why I did not copy all 80 chapters over yet. Thanks for supporting this story so much that you have come here to find more chapters! 🙂 I deleted the old chapters at spcnet, because I am in the process of editing the old chapters. Revision has been slow, unfortunately, since I am trying to add new chapters to the prequel story. ^^ I just started reading your story Melanie~! I hope that I’ll be able to read the edited chapters soon. Thank you~! Thanks for your continued support of the main story. Actually, since you have expressed an interest in reading the continuation of the main story and have made an effort to hunt the story down to Cloud Manor, I will post up Chapter 83, even though I haven’t finished revising the story yet. I just need to proofread it and it should be up in a few days. Please let me know if you enjoy the new chapter. 🙂 Thank you for your years of support! Hi Moonblossom. How do you make a thumbsup sign? Hi Rusydil Faiz. Thanks for being so understanding about my schedule. I’m truly a slowpoke, compared to Moonblossom, who is just as busy, if not busier. I just wonder. Is this just reading book or also a movie? It will be good if it’s making into a series. I wanna know cuz I love watching than reading. I want to see action. I want to apologize to everyone for taking so long to respond to comments! I completely missed all these comments here, because for some reason, I don’t get an email notification when new comments get posted. Anyway, thank you, lee, for reading. Unfortunately, this is just my humble attempt at story writing and is not a drama. I don’t know, Moonblossom… I don’t think the story is good enough to be adapted into a drama. And my husband keeps making fun of my writing that I am embarrassed to show it to a wide audience. Plus, it hasn’t even ended, but soon! It’s ending soon! 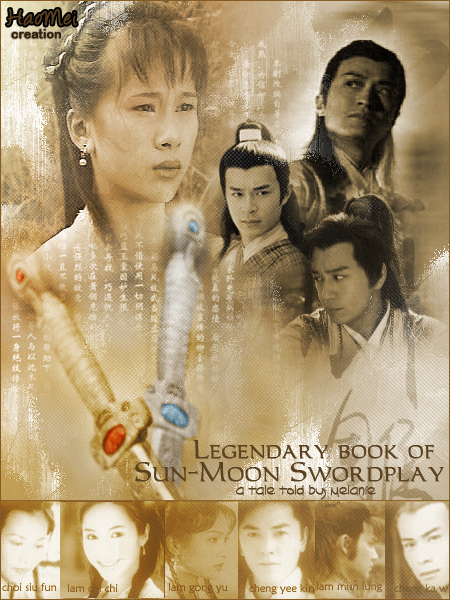 Everything will converge into one big fight once Siu Han reunites with her Sword of Moon. I’m going to buy myself a big gift when I pen the final chapter. Goodness, finally! An update! I don’t know how long it’s been, but for sure, it’s been many YEARS! Kristy and Ekin are one of my favorite couples, but I like the characters just as much due to the awesome story! 🙂 Oh the sweet memories of watching the 80s and 90s tv series. I truly hope I don’t have to wait something like 5 years for another update. Of course, family and work come first. However, I just want you to know that I attribute some of my white hair to the wait. Not quite on the same level as Xiao Long Nu to Yang Guo, but close enough :D.
I stumbled across your story on Spcnet and loved it. Unfortunately, since I’m a new fan, I never got a chance to read the original chapters before they were taken down for revision. Is there a chance that you could repost them while going through the revisions? I feel like there’s so much that I still need to read through! By the way, I love your cast of actors. They are definitely amongst my favorites in HK dramas; epecially Gilbert and Annie. I was actually just rewatching Heroines of the Yang’s again last week! Thank you for putting your time into such a great story! I think you will find Gilbert’s character in here vastly different from his role in Heroine of the Yang; he’s actually a nice guy in here. 🙂 But with his acting chops, I think he can handle any role with aplomb. As for reposting the old chapters, I can certainly do that as soon as I get back from my conference. Right now, I am preparing to leave for my conference. However, I have to warn you that my revisions involve some minor plot changes, and I am considering removing a few cameo/insignificant side characters to trim down the cast list. Therefore, reading the old, unrevised chapters might be a waste of your time, even though the general plot will largely remain the same. Also, the writing in the old chapters might not flow as nicely and might have quite a bit of grammatical errors, since I started the story when I was quite young and inexperienced with grammar. If you still wish to plow ahead and read the old chapters, then let me know, and I will repost them as soon as I get back. In the meantime, may I interest you in reading the prequel to this story while you are waiting for more chapters for the main story? The prequel is loosely connected to the main story, but can be enjoyed as a standalone piece. Have you ever thought about converting those tapes to DVD’s? I’m not sure how much they will cost though. I’m the same as you. There are so many 80’s and 90’s dramas that I’m scared of never being able to watch again. When I visit anywhere with a Chinatown, I’m always hunting for them on DVD’s. Yes, I can already tell that he’s a nice guy in this story, which I think is great! However, I will always like his portrayal of Yelut Ho Nam as well! Did you ever get a chance to watch Heroine of the Yangs II; where he loses his memories? Agreed, his acting is amazing. I can literally picture these characters acting out your story. It’s great! If you don’t mind, I would still love to read the old chapters while I wait for the revisions. 😀 I’m such an ancient Chinese drama/novel buff! Right now, I’m reading Husband Be A Gentleman. I stumbled across that because I was clicking on one of the “Other C-Novel Sites” link that you and Moonblossom have on here. Thank you to you both for sharing other sites with us! Have a great time at your conference! Haha Mel. Feel the readers’ love yet? You are our Xiao Long Nu n we are like Yang Guo waiting at the cliffs. I am one of your old readers, I started reading the story maybe 13-14 years ago on winglin. I can’t remember exactly how long it had been, but I was still in high school back then. The other day while looking through some of my old pictures form those years, I remembered about how much I used to enjoy reading this story, I can say that your story was also a part of my teenage life growing up. So I searched on google and I found this site. I want to leave a comment to let you know that I still think about legendary book of Sun-Moon swordplay, after all these years, even though a lot of things in life had changed, and I will be ready to support if you have some time to continue with the story again. It’s so nice to see you here! Of course, I remember you, so there is no need to introduce yourself! 🙂 I am so touched that my story has left such a memorable mark in your life. Has it really been 13-14 years? I, too, was a teenager when I started writing Legendary Book. Time flies, and though life has brought many ups and a few downs for me, one thing remains true – my excitement whenever I read a comment from a reader. To know that you still remember me and that you have even bothered to google my story to locate it have brought happy tears to my eyes, literally. Thank you. These days, I am struggling to find time to write, though I still mentally review what I want to write in my chapters in bed right before I fall asleep. I think some readers have asked me to post up whatever chapters I have already written on this story. I might just do that. I’ll have to dig up those saved files. We have moved and not everything has been unpacked yet. Just out of curiosity, have you read my other story, The Prequel? I am just wondering what you think of my more recent writing style compared to the style of my older story. I should go to sleep. I have to work in the morning. Again, thanks for dropping by and letting me know that you are still hanging around. It means a lot to me.